Home | News | Introducing Protein Water powered by PRONATIV®. 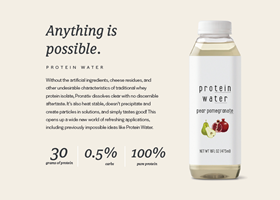 Our Protein Water has nothing but the cleanest ingredients and is created without harsh processing. With no fat and no sugar, this new format is great for all your protein needs. The cleanest ingredients. Protein coming straight from the best milk. Muscle recovery starts from the first sip. With endless flavour choices. The ideal blend of power and freshness. Only the best for you. With Protein Water, you can reach your full potential.